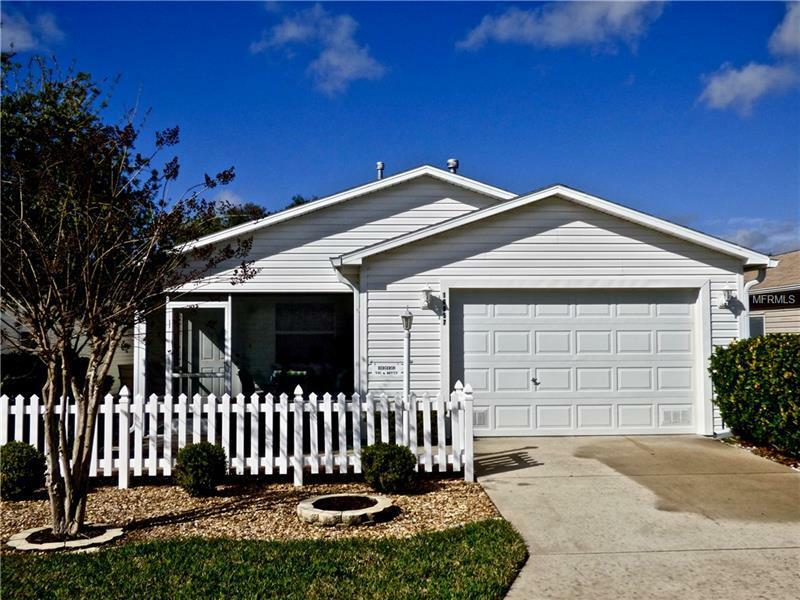 PRISTINE 2 bedroom, 2 bath COLONY Patio Villa in the Village of Woodbury. BOND is PAID! Comes FURNISHED. (Items w/stickers do not convey.) Only lived in 1/2 THE TIME by the Original Owners. The Spacious Open-Concept Floor Plan has beautiful 18" CERAMIC TILE FLOORING in the Living/Dining area and the Kitchen. The EAT-IN kitchen is equipped with a Newer (2015) REFRIGERATOR & DISHWASHER, Oak Cabinets, GAS range, Microwave New in 2017, and a CLOSET PANTRY. The Master Bedroom has LAMINATE Flooring, an EN-SUITE Master Bath, and a WALK-IN Closet. HVAC was NEW in 2014! HOT WATER Heater NEW in 2018. DOUBLE-PANE, LOW-E Windows. Handy Workbench in Garage. Extra Storage in Garage Laundry. Garage ceiling and door are insulated. GOLF CART Available Separately. In the front you can enjoy the Florida Sunrise from the Screened-In Lanai! Move-In Ready! Traffic is NOT an issue - even during Peak Season! This is a lovely home in a location convenient to numerous golf courses, shopping, dining, pools, tennis, the VA Clinic and all the fun in The Villages!! No BOND. Maintenance Assessment is $329/year. Note: Square footage information is taken from the Public Record and is deemed reliable, but not guaranteed. Room dimensions are approximate: buyer to verify.